I’m in the planning stages of building a new, larger N scale model railroad layout. The thought process is basically to try to work in as many of the features that I’ve wanted on a layout since I started reading Model Railroad magazine when I was about 13 years old. Among those features is a locomotive service facility complete with a roundhouse and turntable. 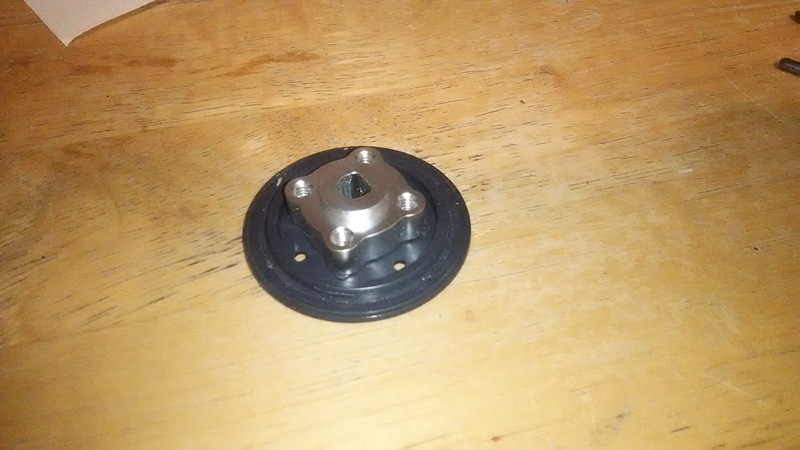 There aren’t very many options currently available: there are ready-made affordable turntables from a few manufacturers, but they’re too small to handle the larger steam locomotives I plan to eventually have. There’s one turntable from Walthers that is large enough, and it’s very cool with automatic indexing (moving to a selected track), etc. But, it’s priced at around $250.00! I set out to find an affordable alternative. I found the older, out-of-production 120′ turntable kit (also produced by Walthers) on eBay for $35.00. I’ve read up on the kit, and while it has some issues (some of the plastic parts can warp over time in the box, if left unassembled), I figured it was worth a shot for a little over 10% of the retail price of the new one. I do want the turntable to be motorized. Walthers made a motoring kit for it, but I’ve seen it in action, and it’s not very smooth, and is pretty noisy. 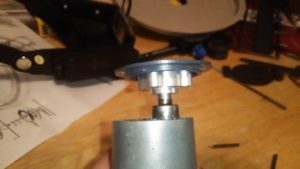 For a proof-of-concept, I cobbled together an assembly consisting of 2 components: A left-over motor from replacing my replica R2D2’s drive motors, and a 6mm bore hub from servocity.com (also left over from R2). I simply attached the hub to the base disc that the turntable bridge/deck sits on by drilling a couple of holes for the screws. For testing purposes, I press-fit the sides of the turntable bridge into their holes on the main disc. 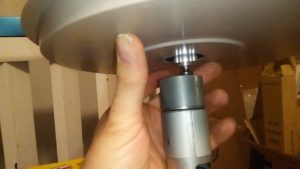 Then, I placed the disc and hub into place in the turntable pit, slipped the hub onto the motor shaft, and tightened the set screw. For testing at this point, I just held everything together by hand. This motor is much too fast (about 55 rpm at full voltage), but the concept works, and it’s much more quiet than the Walthers drive.